RedFin Charters was created around the love of fishing, living, and exploring. Life is short, so it is important to appreciate what the world has to offer in its natural environment. With our home base in Charleston, our roots are in southern hospitality. We love exchanging stories, and we hope that your experience with RedFin Charters will create a story for you to share for years to come. As professional anglers, we love the sport of fishing and the environment. 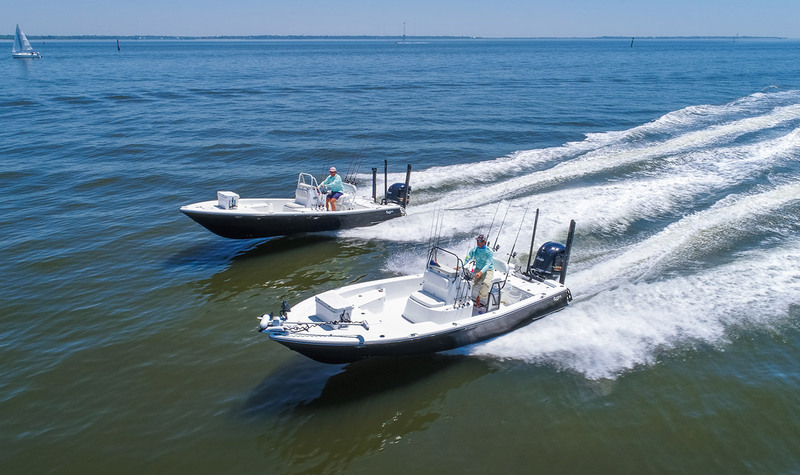 With 20+ years of combined experience in Charleston, we understand the changing waters, migration patterns, and habits of the Redfish, Speckled Sea Trout, and Flounder that we target in the Lowcountry. We also have a broad knowledge base for the Pacific Northwest, and guide for Steelhead, King Salmon, and Silver Salmon with a sister company and partner lodge in Forks, Washington. Book your charter now and see our available dates/times. "Joel is the best fishing guide in Charleston. He is polite, educational, fun and most importantly he will put you on the fish all day. Joel has taken my family and business partners on multiple trips and they are always a blast. His boat and equipment are all top of the line. This fishing experience always exceeds my expectations!" "He's got the top equipment, 1st rate knowledge of the area, and is extremely patient and kind. All the things you would want on a fishing trip." "My wife and I went for a half day with another couple we came to Charleston with. The guide asked what kind of fish we wanted to catch....we told him we just wanted action and big fish. He proceeded to ask what each of our biggest fish was and said the best bay fishing right now is for sharks and that's what we did. We caught 7 sharks and 2 sting rays. 2 of the Sharks were over 6 ft."
"Had a great time with Chris! He knew exactly where to go so we could have a fun afternoon of catching fish. He was willing to cast for my fiancé the whole time so he could get the bait right where she needed it. The largest fish she had ever caught was the size of a blue gill. Due to Chris, she got the experience catching two large red fish. He took us to an area far from where we started, which allowed us to see the Charleston harbor as a bonus." "I am a travel agent and deal with many fishing charter companies around the world. Joel is by far the best captain / owner in the industry. He gave me tons of information and recommendations to make this corporate fishing outing fun for my clients. They were very appreciative for what his team did for them. You can't go wrong with RedFin Charters! Thank you, Joel, and your team for making this possible. I can't thank you enough!" "Great trip! Inshore was perfect for our 6 year old's first time fishing in salt water. Boat was perfect size, nice tackle, comfortable ride. Captain Ethan found us some nice reds and a few bay sharks. Next time we're down this way will definitely be calling RedFin again." "Best fishing all amazing knowledgeable captains, if you're looking for a good charter guide these guys are it." "We had a great time with Joel! The best fishing trip I have ever been on! He really goes the extra mile to serve his clients! Also, his boat is the nicest fishing boat I have ever been on."